Hans Gerein believes that good things come with time, perseverance, and a little luck, however, extreme circumstances may dictate otherwise. Situations beyond Hans’ control thwart a plan to follow his brother to America, and guilt haunts him when three members of his family go missing during the ill-fated attempt to escape Russia. After a false charge of anti-Soviet activity land Hans and his wife in the notorious gulag system, she returns home a broken woman set on destroying herself. A distraught Hans honors her dying wish, a decision that may haunt him forever. He discloses the dark secret to his daughter years later while trapped in the midst of a battle raging between the Soviet and German armies. She feels betrayed, breaks from his embrace and dashes from their refuge. Hans frantically searches for her until he is arrested and confined in a Berlin refugee camp where a surprise visitor guarantees their unlikely reunion. Perhaps Hans’ assumption is correct . . . his life is cursed. What do readers think of Dear American Brother? A touching story about tragedy, love, and survival. Joe J. 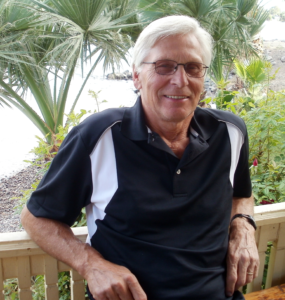 Elder spent his formative years in a German Russian community in Saskatchewan. His penchant for history took him to Germany several times to record the experiences of the relatives who survived the Stalin Era. A tour by train from St. Petersburg to Gulag Camp Perm 36 in the Urals, and 1989/2006 visits to the ancestral villages near the Black Sea in Ukraine were highlights in his quest for first-hand information for DEAR AMERICAN BROTHER. Joe also co-produced and wrote the narration for the acclaimed documentary, Germans from Russia on the Canadian Prairies. Several of his articles have appeared in magazines highlighting Germans from Russia, one winning a prestigious Story of the Year award. He enjoys an active, full life in Calgary, Alberta. His passions are writing, playing sports of all kinds, adventure travel with his wife and, most of all, spending time with his family. A German grows up in Russia in the first half of the 20th century and weathers the tyranny of both Stalin and Hitler. Johannes “Hans” Gerein is born in Chornov, a small German community in the south of Russia. After Germany and Austria declare war on Russia, Hans’ uncle Heinz is forcibly conscripted into service, and his Uncle Pius moves his own family to America, taking Hans’ older brother, Kurt, with him. Hans’ father is eventually drafted as well. When the war is concluded with an armistice in 1918, the czar’s Imperial Russian Army becomes the Red Army, and revolutionary sentiments threaten Hans’ land, now vulnerable to looters and government-sanctioned confiscation. Violence is everywhere: While riding to Selz, Hans and Grandpa are arrested by soldiers. Hans narrowly escapes, but his grandfather does not. Hans pines to be reunited with his brother, but the costs of travel and the bribes necessary to acquire the necessary paper work are prohibitively expensive, and despite financial assistance from Kurt, his dreams are repeatedly thwarted. He marries his childhood sweetheart, Katie, and they have a daughter, Amilia Lydia. When Hans is arrested for sedition, both he and Katie are sent to gruesome labor camps. Hans escapes and makes his way back to Chornov, but Katie never recovers fully from her emotional ordeal. Threatened by starvation, she begs Hans to let her sacrifice her life for Amilia’s. Debut author Elder paints an evocative picture of a community ravaged by relentless political turmoil. The author movingly captures the bleakness of Hans’ predicament and his gradual loss of hope: “The callousness of the regime froze the blood in my veins. I buried my face in Mama’s hair and wept unashamed at the truth of her words, at the bleakness of our future. I finally understood, we were slaves bound to Lenin’s communist ideals.” Furthermore, Elder’s historical research is impressively painstaking. Not only does he accurately describe the politics in Russia, but he also authentically limns the culture of the small farming communities decimated by Soviet policies. A riveting blend of historical detail and fictional drama. Joe Elder’s powerful debut novel, DEAR AMERICAN BROTHER, is an unflinching account of life under a corrupt, brutal, authoritarian regime. The author takes us into the heart and mind of an Everyman who tries to escape the land of his birth and give his family a better life in America. Clearly, this story is relevant to today’s world and the plight of thousands of would-be immigrants trying to flee the terrors of their homelands. In fact, the protagonist is an ethnic German living in Ukraine during the 1917 Communist Revolution, Stalin’s campaign of mass starvation, and WWII. This important story will give readers pause for thought, but it is not only a sad testament to man’s continuing inhumanity to his fellow man; it is about life’s simple joys, deep family bonds, and the will to survive. DEAR AMERICAN BROTHER follows German-Russian Hans Gerein, who dreams of a better life in America as World War II spins his family and roots out of control as he stands in the crossfire of nations at war. The story opens with the narrator’s desperate search for a teenage daughter lost during the recent communist onslaught. The promise of America is a beacon of hope as Hans reflects on his past and struggles with his present reality, and readers are swept into his family history, from encounters with the infamous Gulag system to American brother Kurt’s promises in the aftermath of war, which injects dreams into the growing realities of oppression and military rule. One powerful attribute of this story lies in its vivid portraits of what this kind of oppression looks like: “The largest of the military trucks, the timber-framed box stacked with sacks of wheat and flour, rumbled around the corner and ground to a halt in front of the church. Captain Shukov slid from the passenger seat. Exuding an authority one could almost smell, he adjusted his collar and climbed the stairs to face the Reinbolds. He raised his arm, made a fist, then uncurled two fingers and pointed to the trembling couple. “During the search, my assistants found wheat hidden under a pile of potatoes in their root cellar. An entire bucket of wheat!” A sorrowful moan rippled through the crowd. As the narrator navigates a world on eggshells replete with spiritual and physical hunger, readers are carried into a changed landscape where nothing is stable and everything is being questioned. The result is a chillingly vivid tale of communism, country, and salvation that deftly captures a bygone world and a protagonist changed by the difficult choices it presents. Hans’ quest to reunite the remnants of his family under the most impossible of conditions creates story that’s equally hard to put down. In Joe Elder’s novel, DEAR AMERICAN BROTHER, readers live what may be an unfamiliar history—a time when the Gerein family, rooted to the land, experiences upheaval to their culture and way of life in the wake of World War I and the Russian Revolution. Elder demonstrates earnestly and without reservation how young Hans’ dream for a better life in America, and the security it may offer, will not die despite the unpredictable methods of oppression imposed by warring nations. 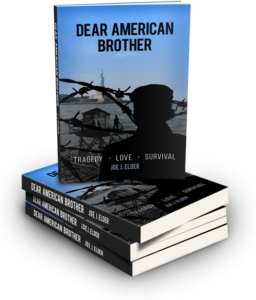 DEAR AMERICAN BROTHER is available through Amazon Kindle, Ibooks, and Kobo in ebook format. If you would like a paperback copy, click on the "BUY NOW" button, or leave your information on the contact page below and I will send one to you for $15.00 Canadian, including shipping. Thank you for your interest.